GRETA AND KATE ON THE GREAT WALL OF CHINA! Use our website to find out all about us: our practice times, where we swim, schedule changes, meet information and results, and useful swimming links! Be sure to join Wind N Sea’s facebook page to see cool swim videos and articles Paton is sharing! Congratulations on WSST being named a Bronze level team for the 2019 Club Excellence Program! USA Swimming had over 370 teams apply this year and the competition was tough. WSST is one of only 4 teams in San Diego to be awarded! (RSD, NCA, SBA) You will see our Bronze level logo on our website, tshirts, and at the pool! Practices are adjusted before the CIF Championship Tournament games begin. Blue and Red groups will swim from 2:30 to 3:30pm. No practice Wednesday. Novice will swim Monday from 3:30 to 4:00pm. No practice Wednesday. White will swim Tuesday and Thursday from 3:30 to 4:15pm. Senior group will swim Tuesday, Wednesday, Thursday mornings only from 5:30am to 7am. Normal practice times for all groups on Friday. JO Max entries are due to me by Tuesday, Feb 12. All swimmers not qualified for JO Champs are eligible. Take a look at our calendar! There are quite a few events/changes coming up as we head into February. New Officials Clinic Thursday at 6:30pm. We need officials to represent WSST at swim meets! No experience needed to start the process! San Diego Imperial Swimming’s 1st Open Water Clinic! Sunday, Feb 3. Coggan is hosting the CIF Water Polo championships and our schedule will be adjusted earlier. Feb 7, 8, 13 – Afternoon practices cancelled. Feb 11, 12, 14 – Red/Blue groups 2:30 to 3:30pm. Novice and White swim on their normal days but starting at 3:30pm. Senior group will only swim in the mornings: Tues, Wed, Thurs, 5:15am. Friday, Feb 15 is back to our normal schedule. JO Max Championship meet entries due to me before 4:15pm on Tuesday, Feb 19. This is a championship meet for all swimmers that did not have JO qualifying times. All swimmers that are eligible are encouraged to participate! Athletes will meet with a couple of the top open water competitors in San Diego, learn about USA Swimming’s track for Open Water, learn some open water racing skills, and practice them in an open water pool course. All Athletes, especially the younger ones, should be comfortable in the water and have plenty of meet experience. More info danpeckpacificswim@gmail.com. 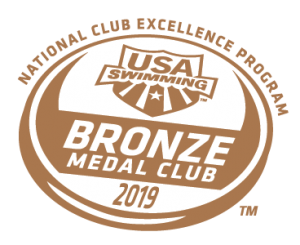 WSST was awarded a Bronze medal in the USA Swimming Club excellence program! Top 200 teams (that apply)! Based on swimmers’ achievements at the National level and administrative efforts (Club Recognition Program) on Paton’s part. Make sure to take a look at the meet results from our last two meets! MRA C meet on Dec 9 and Winter Age Group Championships Dec 14-16. Fun to see everyone racing and their hard work paying off! We are also working on getting our team equipment/apparel store back in action. After Making Waves unexpectedly closed their store, we’ve moved back with Paradowski’s Swim Shop. The will have on online store that is being built as I type. You can always go the the physical store on Convoy Ct as well. Make sure to tell them you swim with Wind N Sea! Not only do they have all of our TYR team specific suits, jackets, backpacks, etc. but they also give a portion of all sales back to the team! Everything should be up and running by the end of the day. NEW USA Swimming Membership Option! Congratulations to this year’s WSST swimmers that earned NISCA All America Awards while representing their high schools! Swimmers must meet All American time standards and be ranked top 100 in the nation while competing at their high school championships. We will finish our summer practices with one big group practice Friday! All groups with a 4pm start. Wrapping things up with a short mini meet and some pizza! Long time coming but congratulations to our 2018 Wind N Sea Swim Team graduates! Manny Rivas – WSST since Jan 2018, attending ? Great meet for Pierce Dietze! Swam 3 individual events and one time trial. Best times in all! San Diego Imperial Swimming records in the 50 free and 100 free! WSST records in all! 200 free top 8 finish! One of only 3 San Diego swimmers to finish in the top 8. His time would have qualified him for the 2016 Olympic Trials! 2020 Olympic Trial standards will be announced in September with the qualifying period starting Nov 28. Pretty exciting! take a look at our FB group page for pictures, videos, etc. Great new meet last weekend! WSST competed Friday, Saturday, Sunday, and Monday in the TYR Splash and Dash in Coronado. Fast times, fun times, and exciting new races! 50s in the strokes! Swum in a head to head, bracketed format. Pretty cool! 15 WSST Team records set! 10 in various age groups and 5 in the Open bracket (all ages)! Pierce Dietze with 6 records, Yuto Fraley with 5 records, Adrian Jimenez with 2 records, and Natalia Hackbarth with 2 records! 8 Improved USA Swimming Standards! Yuto Fraley with 4 AAA times and 1 AAAA! Miles Koupal with 1 AAA and 1 AA. Pierce Dietze with 1 AAA. Both Yuto and Pierce stood on the podium and received TYR prizes several times! Exciting! Some of the pictures and videos are up on the Wind n Sea Facebook page. Take a look! Our next meet is the SBA AB meet for swimmers that have achieved San Diego Imperial Swimming A or B times. Short course or long course. The eligibility report on our calendar has been updated. I set it up to convert short course times to long course. We will use actual times for the meet entries. The report shows 47 swimmers eligible! Let’s get racing! Entries are due to me or Coach Daniel by Tuesday, June 26. Check the Meets page for more info about this weekend’s swim meet!! I am excited to announce that Wind N Sea Swim Team has entered a team sponsorship agreement with TYR! TYR will be working closely with me to help promote our team brand. That starts with how our swimmers, coaches, and parents look on the deck. We will now have team suits, apparel, and equipment. TYR is a local company (Huntington Beach) that is a big company in the swimming community. Get yours at Paradowski’s today! From the JO Max meet! Make sure to check the calendar for all our upcoming events, meets, practice schedules etc.! Make sure to check our WSST calendar! Swim meets are scheduled through March. I will add more detailed information as it becomes available. Check this website and our calendar page for upcoming swim meets, entry deadlines, procedures for entering meets, etc. WSST Swimmers are All American!! Parker Seale and Dominick Wallace named to USA Swimming’s Scholastic All American team! Winter Junior National times as well as grade point average considered. Click here to see all the All Americans. We’ve set up a new way to view all things swim meet oriented! Eligibility reports, meet information, results, records, etc. Click on the event in question. A small box pops up. Click on the “more details” link. lower left of the box. Listed under “Attachment”, you will see pdf links like: tmiresults.pdf and tmrecordmatch.pdf. Click on which ever one you need to view. I’ve set everything to public viewing. If you have any problems, let me know. If you go to future events, you will see pdf attachments for meet information, eligibility reports, meet entries, etc. Take a look! Explore!